I love this dish. It’s easy to make (not quick, but easy), it’s impressive and makes any soup better. If I could have a signature dish, I hope it would be this one. 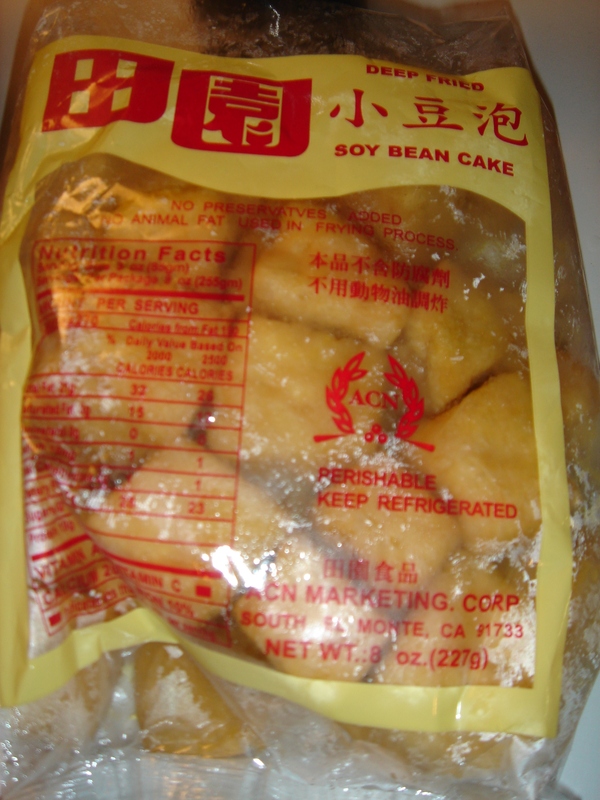 A mixture of pork, green onion, and vermicelli is stuffed into little pillows of fried tofu goodness. 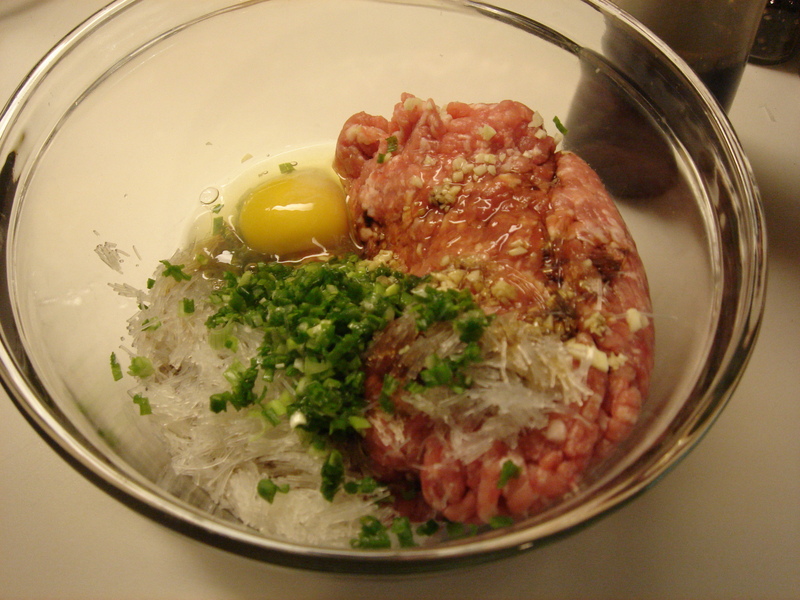 I throw an egg in the mix to keep the pork relatively loose when it cooks. You can also mix in tofu or finely minced cabbage to achieve this effect. 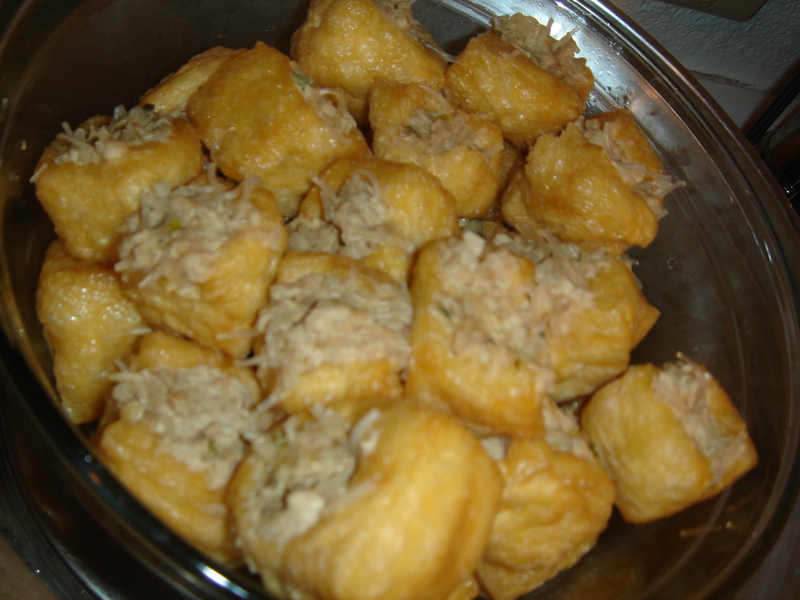 Extra pork mixture can be made into steamed pork buns (that’s another post), or thrown into almost any stir fry that uses ground pork. B fried the extra up with some scrambled eggs for a simple but protein-filled dinner. These tofus perfect for throwing into a noodle soup or hot pot, as the tofu soaks up the liquid and when you bite into it, you get a juicy, flavorful tofu, chock full or garlicky pork. Yum! The ingredient list looks really fussy, but it’s not actually. This is how I made it this time, but usually I don’t measure or even use this exact mix of ingredients. It’s a very forgiving dish. Soak vermicelli noodles in water until soft, then cut into 1/4-inch lengths or smaller. 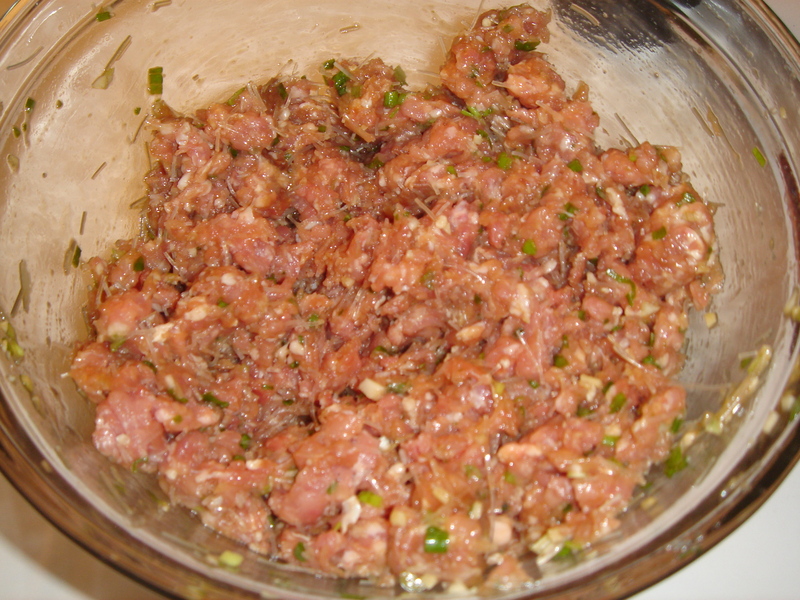 Combine all pork ingredients in a bowl and mix. My mother-in-law told me that if you want the pork to stay in cohesive lumps (like in dumplings) to always stir in one direction. But if you want to keep the mixture loose, stir in both directions. I don’t know if that’s true, but she’s been cooking a lot longer than I have, so I went back and forth with the stirring. I should note something about the seasoning: it’s pretty much up to you. I’ve been mixing ground pork with soy sauce and cooking wine for many years, so I know how it should smell after being properly seasoned. Feel free to do what works for you. Now comes the fun (or labor-intensive) part. Take a fried tofu and poke a hole in it with your finger. Clear some space in there so you can stuff in plenty of delicious pork. Then get the pork in there! I use a combination or chopsticks and my fingers, but as long as it gets in there, it doesn’t really matter how you do it. I pile them in a big glass bowl and steam them in my rice cooker. If I have any napa in the fridge, I’ll put a couple of leaves in the bottom of the bowl for an extra sweetness.